Bottom trawling is trawling (towing a trawl, which is a fishing net) along the sea floor. It is also referred to as "dragging". The scientific community divides bottom trawling into benthic trawling and demersal trawling. Benthic trawling is towing a net at the very bottom of the ocean and demersal trawling is towing a net just above the benthic zone. Bottom trawling can be contrasted with midwater trawling (also known as pelagic trawling), where a net is towed higher in the water column. Midwater trawling catches pelagic fish such as anchovies, tuna, and mackerel, whereas bottom trawling targets both bottom-living fish (groundfish) and semi-pelagic species such as cod, squid, shrimp, and rockfish. Trawling is done by a trawler, which can be a small open boat with only 30 hp (22 kW) or a large factory trawler with 10,000 hp (7,500 kW). Bottom trawling can be carried out by one trawler or by two trawlers fishing cooperatively (pair trawling). "of so small a mesh, no manner of fish, however small, entering within it can pass out and is compelled to remain therein and be taken...by means of which instrument the fishermen aforesaid take so great abundance of small fish aforesaid, that they know not what to do with them, but feed and fatten the pigs with them, to the great damage of the whole commons of the kingdom, and the destruction of the fisheries in like places, for which they pray remedy." "three fathom long and ten mens' feet wide, and that it had a beam ten feet long, at the end of which were two frames formed like a colerake, that a leaded rope weighted with a great many stones was fixed on the lower part of the net between the two frames, and that another rope was fixed with nails on the upper part of the beam, so that the fish entering the space between the beam and the lower net were caught. The net had maskes of the length and breadth of two men’s thumbs"
The response from the Crown was to "let Commission be made by qualified persons to inquire and certify on the truth of this allegation, and thereon let right be done in the Court of Chancery". Thus, already back in the Middle Ages, basic arguments about three of the most sensitive current issues surrounding trawling - the effect of trawling on the wider environment, the use of small mesh size, and of industrial fishing for animal feed - were already being raised. Until the late 18th century sailing vessels were only capable of towing small trawls. However, in the closing years of that century a type of vessel emerged that was capable of towing a large trawl, in deeper waters. The development of this type of craft, the sailing trawler, is credited to the fishermen of Brixham in Devon. The new method proved to be far more efficient than traditional long-lining. At first its use was confined to the western half of the English Channel, but as the Brixham men extended their range to the North Sea and Irish Sea it became the norm there too. By the end of the 19th century there were more than 3,000 sailing trawlers in commission in UK waters and the practice had spread to neighbouring European countries. Despite the availability of steam, trawling under sail continued to be economically efficient, and sailing trawlers continued to be built until the middle of the 1920s. Some were still operating in UK waters until the outbreak of World War II, and in Scandinavia and the Faroe Islands until the 1950s. English commissions in the 19th century determined that there should be no limitation on trawling. They believed that bottom trawling, like tilling of land, actually increased production. As evidence, they noted that a second trawler would often follow a first trawler, and that the second trawler would often harvest even more fish than the first. The reason for this peculiarity is that the destruction caused by the first trawl resulted in many dead and dying organisms, which temporarily attracted a large number of additional species to feed on this moribund mass. Bottom trawling has been widely implicated in the population collapse of a variety of fish species, locally and worldwide, including orange roughy, barndoor skate, shark, and many others. The design requirements of a bottom trawl are relatively simple, a mechanism for keeping the mouth of the net open in horizontal and vertical dimensions, a "body" of net which guides fish inwards, and a "cod-end" of a suitable mesh size, where the fish are collected. The size and design of net used is determined by the species being targeted, the engine power and design of the fishing vessel and locally enforced regulations. 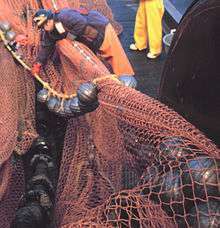 The simplest method of bottom trawling, the mouth of the net is held open by a solid metal beam, attached to two "shoes", which are solid metal plates, welded to the ends of the beam, which slide over and disturb the seabed. This method is mainly used on smaller vessels, fishing for flatfish or prawns, relatively close inshore. Otter trawling derives its name from the large rectangular otter boards which are used to keep the mouth of the trawl net open. Otter boards are made of timber or steel and are positioned in such a way that the hydrodynamic forces, acting on them when the net is towed along the seabed, push them outwards and prevent the mouth of the net from closing. They also act like a plough, digging up to 15 cm into the seabed, creating a turbid cloud, and scaring fish towards the net mouth. The net is held open vertically on an otter trawl by floats and/or kites attached to the "headline" (the rope which runs along the upper mouth of the net), and weighted "bobbins" attached to the "foot rope" (the rope which runs along the lower mouth of the net). These bobbins vary in their design depending on the roughness of the sea bed which is being fished, varying from small rubber discs for very smooth, sandy ground, to large metal balls, up to 0.5 m in diameter, for very rough ground. These bobbins can also be designed to lift the net off the seabed when they hit an obstacle. These are known as "rock-hopper" gear. The body of the trawl is funnel-like, wide at its "mouth" and narrowing towards the cod end, and usually is fitted with wings of netting at the both sides of the mouth. It is long enough to assure adequate flow of water and prevent fish from escaping the net, after having been caught. It is made of diamond-meshed netting, the size of the meshes decreasing from the front of the net towards the codend. Into the body, fish and turtle escape devices can be fitted. These can be simple structures like "square mesh panels", which are easier for smaller fish to pass through, or more complicated devices, such as bycatch grills. The cod end is the trailing end of the net where fish are finally "caught". The size of mesh in the cod end is a determinant of the size of fish which the net catches. Consequently, regulation of mesh size is a common way of managing mortality of juvenile fishes in trawl nets. The idea that fish are passively "scooped up" is commonly held, and has been since trawling was first developed, but has been revealed to be erroneous. Since the development of scuba diving equipment and cheap video cameras it has been possible to directly observe the processes that occur when a trawl is towed along the seabed. The trawl doors disturb the sea bed, create a cloud of muddy water which hides the oncoming trawl net and generates a noise which attracts fish. The fish begin to swim in front of the net mouth. As the trawl continues along the seabed, fish begin to tire and slip backwards into the net. Finally, the fish become exhausted and drop back, into the "cod end" and are caught. The speed that the trawl is towed at depends on the swimming speed of the species which is being targeted and the exact gear that is being used, but for most demersal species, a speed of around 4 knots (7 km/h) is appropriate. Bottom fishing has operated for over a century on heavily fished grounds such as the North Sea and Grand Banks. While overfishing has long been recognised as causing major ecological changes to the fish community on the Grand Banks, concern has been raised more recently about the damage which benthic trawling inflicts upon seabed communities. A species of particular concern is the slow growing, deep water coral Lophelia pertusa. This species is home to a diverse community of deep sea organisms, but is easily damaged by fishing gear. 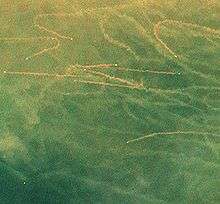 On 17 November 2004, the United Nations General Assembly urged nations to consider temporary bans on high seas bottom trawling. Bottom trawling stirs up the sediment at the bottom of the sea. The suspended solid plumes can drift with the current for tens of kilometres from the source of the trawling. These plumes introduce a turbidity which decreases light levels at the bottom and can affect kelp reproduction. Ocean sediments are the sink for many persistent organic pollutants, usually lipophilic pollutants like DDT, PCB and PAH. Bottom trawling mixes these pollutants into the plankton ecology where they can move back up the food chain and into our food supply. Phosphorus is often found in high concentration in soft shallow sediments. Resuspending nutrient solids like these can introduce oxygen demand into the water column, and result in oxygen deficient dead zones. Even in areas where the bottom sediments are ancient, bottom trawling, by reintroducing the sediment into the water column, can create harmful algae blooms. More suspended solids are introduced into the oceans from bottom trawling than any other man-made source. The UN Secretary General reported in 2006 that 95 percent of damage to seamount ecosystems worldwide is caused by deep sea bottom trawling. A study published in Current Biology suggests a cutoff of 600 meters is a point which ecological damage increases significantly. The United States National Oceanic and Atmospheric Administration banned bottom trawling off most of its Pacific coast in early 2006 and has restricted the practice severely off its other coasts as well. This federal regulation affects areas between 3–300 miles from the coast (areas within 3 miles (4.8 km) of the coast are state regulated). The Council of the European Union in 2004 applied "a precautionary approach" and closed the sensitive Darwin Mounds off Scotland to bottom trawling. In 2005, the FAO’s General Fisheries Commission for the Mediterranean (GFCM) banned bottom trawling below 1000 metres and, in January 2006, completely closed ecologically sensitive areas off Italy, Cyprus, and Egypt to all bottom trawling. Norway first recognized in 1999 that trawling had caused significant damage to its cold-water lophelia corals. Norway has since established a program to determine the location of cold-water corals within its EEZ so as to quickly close those areas to bottom trawling. Canada has acted to protect vulnerable coral reef ecosystems from bottom trawling off Nova Scotia. The Northeast Channel was protected by a fisheries closure in 2002, and the Gully area was protected by its designation as a Marine Protected Area (MPA) in 2004. Australia in 1999 established the Tasmanian Seamounts Marine Reserve to prohibit bottom trawling in the south Tasman Sea. Australia also prohibits bottom trawling in The Great Australian Bight Marine Park near Ceduna off South Australia. In 2004, Australia established the world’s largest marine protected area in the Great Barrier Reef Marine Park where fishing and other extractive activities are prohibited. New Zealand in 2001 closed 19 seamounts within its EEZ to bottom trawling, including in the Chatham Rise, sub-Antarctic waters, and off the east and west coasts of the North Island. New Zealand Fisheries Minister Jim Anderton announced on 14 February 2006 that a draft agreement had been reached with fishing companies to ban bottom trawling in 30 percent of New Zealand's exclusive economic zone, an area of about 1.2 million km² reaching from sub-Antarctic waters to sub-tropical ones. But only a small fraction of the area proposed for protection will cover areas actually vulnerable to bottom trawling. Palau has banned all bottom trawling within its jurisdiction and by any Palauan or Palauan corporation anywhere in the world. The President of Kiribati, Anote Tong, announced in early 2006 the formation of the world’s first deep sea marine reserve area. This measure— the Phoenix Islands Protected Area— creates the world's third largest marine protected area and may protect deep sea corals, fish, and seamounts from bottom trawling. However, the actual boundaries of this reserve and what harvest limitations may occur therein have not been detailed. Moreover, Kiribati currently has only 1 patrol boat to monitor this proposed region. Hong Kong passed legislation banning trawling on 18 May 2011 in an effort to restore the territory's devastated fish stocks and marine ecosystem. The ban came into effect on 31 December 2012. The government paid HK$1.72 billion to affected trawlers in a buyout scheme. Persons who contravene the ban can be fined or imprisoned under the Fisheries Protection Ordinance (Cap 171). Beyond national jurisdictions, most bottom trawling is unregulated either because there is no Regional Fisheries Management Organization (RFMO) with competence to regulate, or else what RFMOs that do exist have not actually regulated. The major exception to this is in the Antarctic region, where the Convention for the Conservation of Antarctic Marine Living Resources regime has instituted extensive bottom trawling restrictions. The North East Atlantic Fisheries Commission (NEAFC) also recently closed four seamounts and part of the mid-Atlantic Ridge from all fishing, including bottom trawling, for three years. This still leaves most of international waters completely without bottom trawl regulation. As of May 2007 the area managed under the South Pacific Regional Fisheries Management Organisation (SPRFMO) has gained a new level of protection. All countries fishing in the region (accounting for about 25 percent of the global ocean) agreed to exclude bottom trawling on high seas areas where vulnerable ecosystems are likely or known to occur until a specific impact assessment is undertaken and precautionary measures have been implemented. 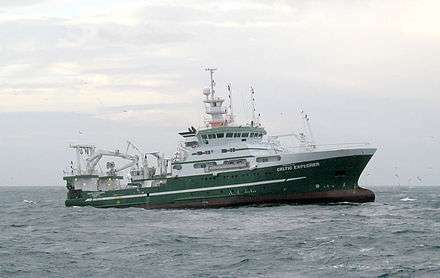 Also observers will be required on all high seas bottom trawlers to ensure enforcement of the regulations. Palau President Tommy Remengesau has called for a ban on destructive and unregulated bottom trawling beyond national jurisdictions and Palau has led the effort at the United Nations and in the Pacific to achieve a consensus by countries to take this action at an international level. Palau has been joined by the Federated States of Micronesia, the Republic of the Marshall Islands, and Tuvalu in supporting an interim bottom trawling ban at the United Nations. The proposal for this ban did not result in any actual legislation and was blocked. ↑ Davis, F (1958) An Account of the Fishing Gear of England and Wales. 4th edition, HMSO. ↑ "Beam trawling on the North Sea". Greenpeace. Archived from the original on 2008-12-10. Retrieved 2009-01-12. ↑ United Nations General Assembly Session 59 Verbatim Report 56. A/59/PV.56 page 4. Ms. Kimball International Union for the Conservation of Nature and Natural Resources 17 November 2004. Retrieved 2009-05-09. ↑ Schiff, K.C. (2000) Sediment Chemistry on the Mainland Shelf of the Southern California Bight Marine Pollution Bulletin 40, pp 268-276. ↑ Ruttenberg, K.C. (2003) The Global Phosphorus Cycle. in Treatise on Geochemistry, Volume 8 (Biogeochemistry). Editor Schlesinger, W.H. ; Executive editors, Holland, H.D. & Turekian, K.K. Pergamon, Oxford, pp. 585-643. ↑ Giannakourou, A., Orlova, T.Y., Assimakopoulou, G., Pagou, K. (2005) Dinoflagellate cysts in recent marine sediments from Thermaikos Gulf, Greece. Continental Shelf Research 25, 2585-2596. ↑ Weaver, Dallas E (2007) Remote Impacts of Bottom Trawling. ↑ Palanques, A; Guillen, J and Puig, P (2001) Impact of bottom trawling on water turbidity and muddy sediment of an unfished continental shelf. Limnology and Oceanography 46(5), 1100-1110. ↑ "Drawing the line". The Economist. ISSN 0013-0613. Retrieved 2015-09-18. ↑ Archived February 4, 2012, at the Wayback Machine. ↑ "NOAA Designates Extensive Area off West Coast as Essential Fish Habitat". Publicaffairs.noaa.gov. Retrieved 2013-09-09. 1 2 "NZ to close 30pc of waters to trawling - National - NZ Herald News". Nzherald.co.nz. 2006-02-14. Retrieved 2013-09-09. ↑ Archived May 15, 2006, at the Wayback Machine. ↑ "Kiribati creates world's first deep-sea marine reserve - World". smh.com.au. Retrieved 2013-09-09. ↑ "Facts About the Trawling Ban in Hong Kong Waters". WWF Hong Kong. Retrieved 27 July 2016. 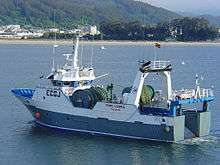 ↑ "AFCD officers intercept illegal trawler (with photo)". Hong Kong Government. 26 July 2016. ↑ Archived September 13, 2009, at the Wayback Machine. ↑ Archived June 26, 2006, at the Wayback Machine. ↑ "Earth Negotiations Bulletin - ENB SUMMARY OF THE WORKING GROUP ON MARINE BIODIVERSITY BEYOND AREAS OF NATIONAL JURISDICTION - MONDAY, 20 FEBRUARY 2006". Iisd.ca. Retrieved 2013-09-09. ↑ "Pacific Leaders Back Bottom Trawling Ban | Scoop News". Scoop.co.nz. Retrieved 2013-09-09. ↑ "Science/Nature | Ban on 'brutal' fishing blocked". BBC News. 2006-11-24. Retrieved 2013-09-09. Benn AR, Weaver P, Billet DSM, van den Hove S, Murdock AP et al. (2010) "Human Activities on the Deep Seafloor in the North East Atlantic: An Assessment of Spatial Extent" PLoS ONE 5(9): e12730 doi:10.1371/journal.pone.0012730.